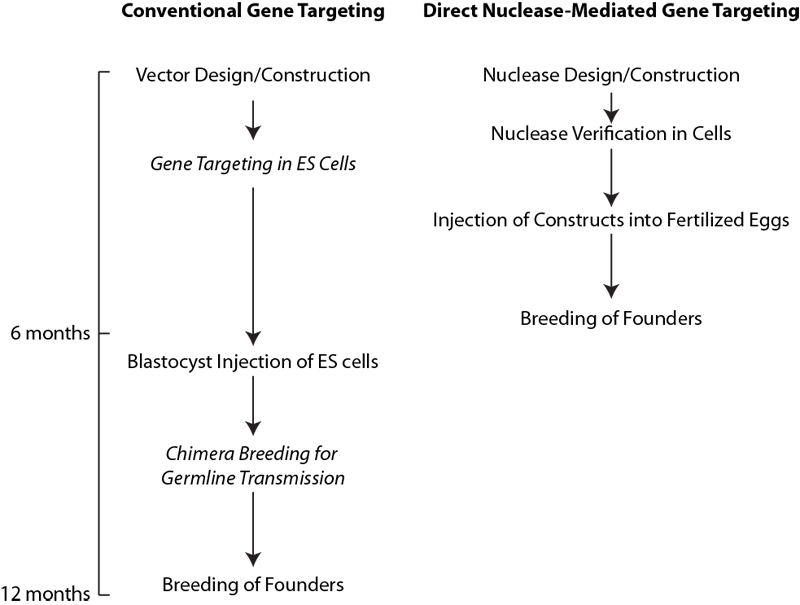 Design: We strongly recommend that we are involved in the CRISPR/Cas targeting strategy design. The efficiency of targeting and thus the likelihood of success depends critically on the design. We will provide you with guidance and protocols on testing candidates to identify highly active gRNAs. Genotyping: Because the founder mice generated by CRISPR/Cas targeted mutagenesis are mosaic for the desired mutation and others, and because targeted allele frequency can vary between 20 and 100% in the founder mice, we strongly recommend that the founder mice be analyzed by deep sequencing at the targeted locus. Deep sequencing gives a quantitative measure of the proportion of desired alleles in each founder and you will know which founders you should breed. Moreover, because we inject different concentrations and proportions of reagents in different batches of eggs and because our results thus far indicate that different constructs work better at different concentrations, it informs us on what concentrations to use should we need to revisit a project. The CWRU Genomics Core has developed an efficient and effective way to analyze the CRISPR/Cas founders. The target region is amplified from genomic DNA of each founder and then bar-coded by founder and analyzed in parallel on a MiSeq. The current costs for genotyping a set of mice by the genomics core is on the order of $1000, and can be much less if you can split the sequencing run with another investigator. The proportions of reads of a particular allele for each founder gives a quantitative read out on allele frequency in the mosaic founders. Breeding of founders to wild type mice establishes heterozygotes which can be genotyped by a simpler assay. Currently, we are having the reagents for injection commercially prepared. Contact us for details. The current commercial vendor costs for injection-ready reagents (guide RNA, Cas9 mRNA and ssDNA oligo targeting vector) are from $1000 to $2000. Before you purchase your reagents, we recommend that you have us review them for accuracy and strategy. We will advise you. Early in your planning, please consult with Ron Conlon to discuss your project. While we endeavor to keep the information on this site up-to-date, this is an extremely fast moving field, and recent developments in the published and unpublished literature and our own experience may benefit your project. We require a demonstration that the guide RNA(s) directs efficient sequence-specific cutting in an in vitro assay. We will inject fertilized mouse eggs with the reagents. While we don't provide a guarantee, our goal is to deliver enough mice to generate the desired mutant mice. You will genotype the mice we provide by deep sequencing, and tell us how many mice are mutant. We ask that you acknowledge the contribution of the Case Transgenic and Targeting Facility in seminars and publications. Investigators need an IACUC protocol from their institution to receive mice from the core. CWRU IACUC protocols need to specify use of the Case Transgenic Core. Investigators normally do not need an IBC protocol of their own for this work: the review for recombinant DNA in animals will be conducted on the information submitted through online ordering for the transgenic core, and will be added to the core's IBC protocol as an amendment if approved. You may be contacted by the IBC for additional information as part of rDNA review after submission of the order. IBC approval is required prior to initiation of injections. Currently (4/24/19), the core is injecting 4 weeks after reagents are available and the project is ready. During this time mice to fulfill the service are ordered and received from Jax. From the injection date, it will be a minimum of a further 6 weeks before we will be able to deliver mice to you (almost 3 weeks for gestation, and at least 3 weeks of postnatal growth before weaning). $4,750 and the cost of donor females for CRISPR/Cas9 on the B6SJL background. The donor female cost ranges from $1,000-$2,000. $5,500 and the cost of donor females for CRISPR/Cas9 on C57Bl/6J inbred background. The donor female cost ranges from $1,000-$2,000. Knockins and insertions should be done with a single guide RNA and the nuclease version of Cas9. We strongly recommend against the strategy using two offset gRNAs and Cas9 nickase. The three priorities in successful knockin design are 1) a gRNA that cuts close (10bp or less) to the desired mutation 2) a highly active gRNA and 3) mutations that stop continued cutting through mutation of the PAM or gRNA seed. For knockouts, we recommend using two gRNAs and Cas9 nuclease to make about a 50bp deletion in the first coding exon--a small, designed deletion is more likely than random indels to generate a null allele, and the 50bp deletion will be easy to genotype. Identify candidate guide RNAs that cut close to the desired mutation. Pick several guide RNAs with the online tool http://crispor.tefor.net. This tool ranks the gRNAs based on specificity, with gRNAs with few predicted off-target sites ranking higher. However, your priority should be to identify gRNAs that cut the closest to the mutation that you want to make, ideally within 10bp. Look at the gRNAs that cut the closest, and determine if the off-target sites are of concern for your project--if the off-target sites are not on the same chromosome as your on-target site, any off-target mutations will segregate away through meiosis when you breed the mice. It will also be preferable if the off-target sites are in sites biologically unrelated to your target (for example, not in a coding sequence of a related gene). Identify candidate gRNAs which are highly active amongst the close-cutting gRNAs with an in vitro cutting assay. Clontech sells a kit (Guide-it Complete sgRNA Screening System) for generating and testing guide RNAs without cloning or transfection. The gRNAs generated by the kit are assayed by incubation with Cas9 protein provided by the kit and your amplified genomic target, then running the products on an agarose gel like a restriction nuclease assay. Run uncut target genomic fragment in one lane and the different gRNA assays on the same gel to determine which gRNAs most efficiently direct cutting--the majority are active, you want to avoid the clunkers. In our experience, this in vitro cleavage assay correlates better with gene targeting in injected eggs than the predictions of online tools or cell transfection assays. For knockins, once an active gRNA which cuts close the desired mutation (ideally 10bp or less) has been identified, design silent passenger mutations that disrupt the PAM (preferred) or gRNA seed (the 10 nucleotides closest to the PAM) to prevent recutting of recombinants. If your substitution generates a mutation in the PAM or seed sequence, it may not be necessary to incorporate passenger mutations. When designing synonymous passenger mutations, be certain to avoid rarely used codons using a mammalian codon bias table. It is possible to recover desired edits without destroying the PAM or seed sequence, but the yield can be much lower because of recutting and mutagenesis of already recombined alleles. Single-stranded oligos of 100-140bp centered on the mutation are sufficiently long for substitution mutations. Purchase the reagents. We purchase our reagents (guide RNAs and Cas9 protein and PAGE-purified oligo) for injection of fertilized eggs from a commercial vendor. Genotype the founder mice. Be aware that PCR assays will not give you a quantitative estimate of the proportion of cells or alleles mutated (founder mice can be mosaic for mutations). Nor will PCR assays necessarily detect the indels generated by NHEJ, which is the most frequent outcome, and a marker of targeted mutagenesis--an important control. You can quantitate the mutant locus in the founder mice by deep sequencing. PCR-amplify the targeted region (amplicon of 200-300bp), bar-code by mouse and deep sequence (MiSeq) following the protocols of the genomics core. Our clients have found that the targeted locus can range from 20-98% of the sequencing reads, so this sensitive approach will help you find your mutant mice, and the quantitation will indicate which mice to breed, in addition to informing us if any targeted mutagenesis occurred at the locus. In our experience, the majority of mice have >20% of their alleles with the edited allele and so should transmit the allele to the next generation. Validate the mutation by sequencing the locus carefully in F1 mice. There have been reports that some of the mutations made can be complex at the targeted locus. This characterization cannot be performed easily in the founders because the founder mice can be mosaic for different mutations--you may be unable to tell if different mutations are in the same cell or on the same chromosome. 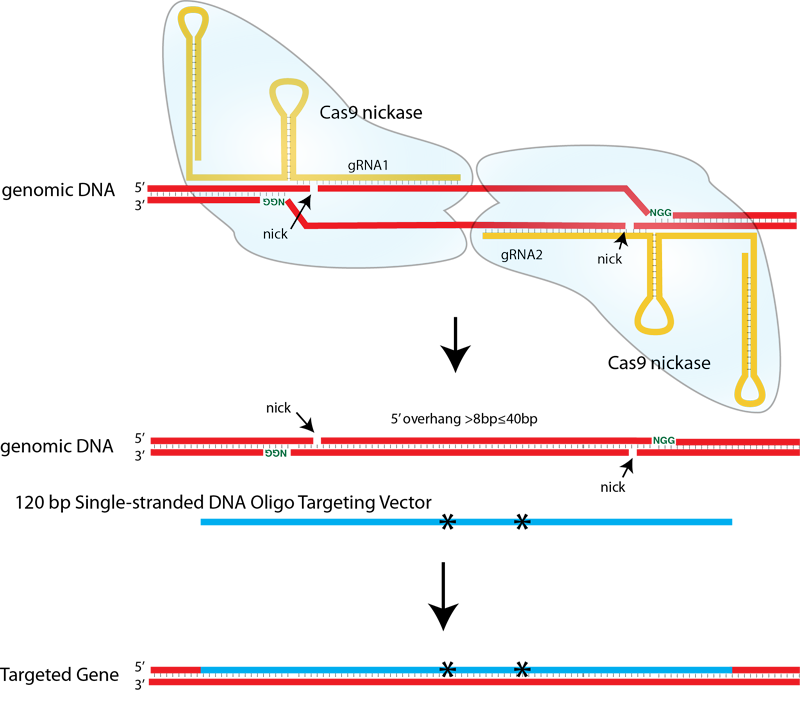 In cells, sequence the locus thoroughly in clonal lines. If there are off-target loci of concern predicted by the software, sequence them as well--this is less of a concern in mice, because unlinked mutations will be bred away if the mutation is outcrossed to wild type mice. Treat each F1 mouse as the start of an individual mutant line. Because of founder mosaicism, you cannot assume that two similar mutations transmitted from the same founder are the same. Moreover, you should characterize (at least preliminarily) multiple independent mutations. The standards are still being set in this field, and it may become a requirement to show that multiple, independent mutations have the same phenotype, in order to account for potential linked, off-target mutations. There has been the suggestion that two independently generated mutations should be analyzed. What cells can be gene-targeted with CRISPR/Cas? CRISPR/Cas gene targeting can be used in any cells. The limiting factor is how efficiently the reagents can be introduced. Why is CRISPR/Cas so efficient? Cells cannot survive with unrepaired DNA double strand breaks and precise repairs to the DSB will be cut again by the endonuclease. Mutagenesis of the recognition sequence by imprecise repair stops the cutting. CRISPR/Cas is more efficient at mutagenesis than other designer nucleases because CRISPR/Cas is less toxic to cells and thus can be expressed at very high levels. CRISPR/Cas is many orders of magnitude more efficient than traditional gene targeting because homologous recombination is mechanistically distinct and not driven by DSBs. What types of mutations can be made by CRISPR/Cas? Deletion mutations can be made efficiently. Cas9 nuclease and two guide RNAs for the ends of the deletion are required (Figure 2). The efficiency of deletion will decrease slightly with distance, but sub-megabase deletions seem to occur at a high frequency. Inversions will be generated with about equal efficiency to deletions--this may have experimental advantages, because it is a disruption which is more conservative of sequence. Targeted insertions are efficient. Cas9 nuclease, a guide RNA and a circular targeting vector are required (Figure 3). Greater sequence specificity and some reduction in NHEJ can be achieved with paired guide RNAs with a nickase version of Cas9 (Figure 4). What are the limitations and shortcomings of CRISPR/Cas? Large-scale replacement (as required when floxing an exon) is not favored. Not all guide RNAs are equally active. Figure 1. Double strand breaks induced by S. pyogenes Cas9 and guide RNA are repaired by error-prone Non-Homologous End-Joining (NHEJ), and in the presence of a ssDNA oligo targeting vector by precise Homology-Directed Repair (HDR). Figure 2. Precise deletion of a targeted genomic region using 2 guide RNAs and Cas9. Figure 3. Precise insertion of a transgene using a circular targeting vector, a guide RNA and Cas9. Small deletions created by NHEJ also are created. Figure 4. Paired guide RNAs and a mutant Cas9 which cuts only one strand (Cas9 nickase) in the presence of a targeting vector can stimulate HDR with somewhat reduced NHEJ and with negligible off-target mutations. 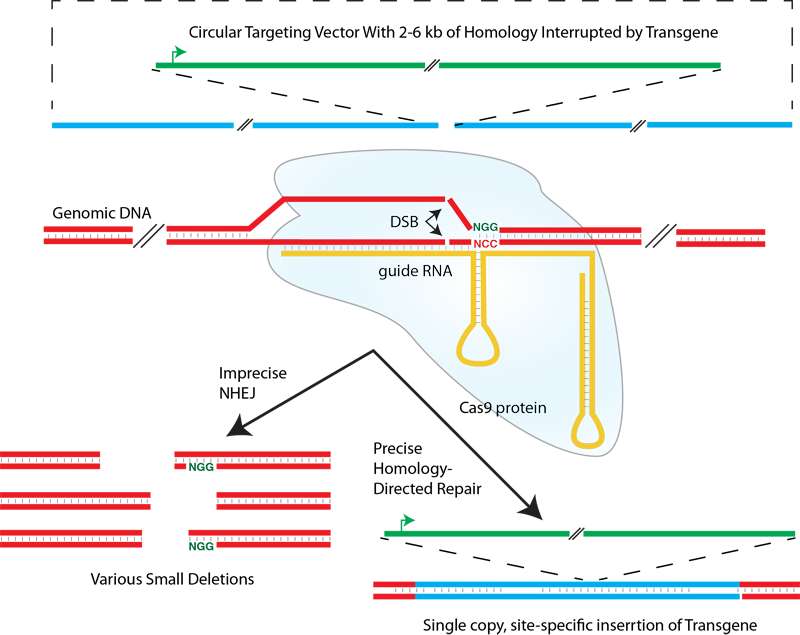 CRISPR/Cas is an RNA-guided, DNA endonuclease. CRISPR/Cas derives from a system for acquired immunity in many species of bacteria and most archaea. These microbes acquire sequences from past, ineffective infections (for example by defective bacteriophages) and store snippets of the infecting DNA in repeat arrays (CRISPR), which they use to cut related DNA in subsequent infections. 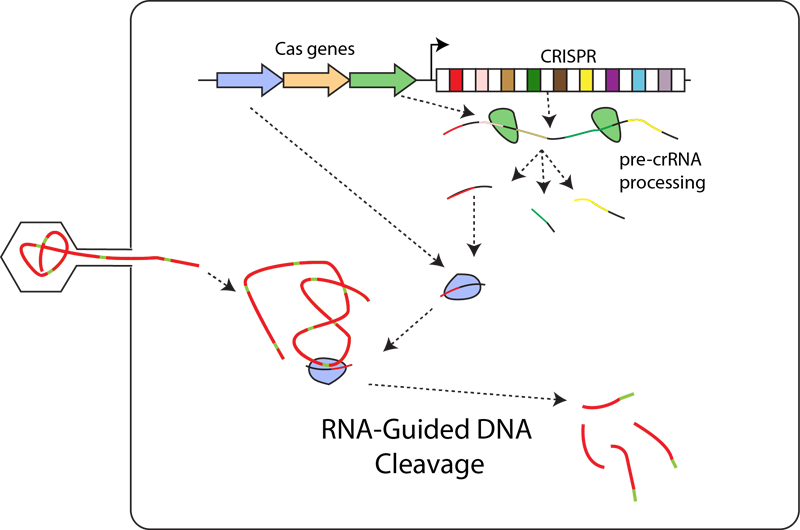 The repeat array (CRISPR) is transcribed and the RNA processed into smaller RNAs. Immunity against subsequent infections derives from an RNA-guided DNA endonuclease consisting of Cas protein(s) and small RNAs. 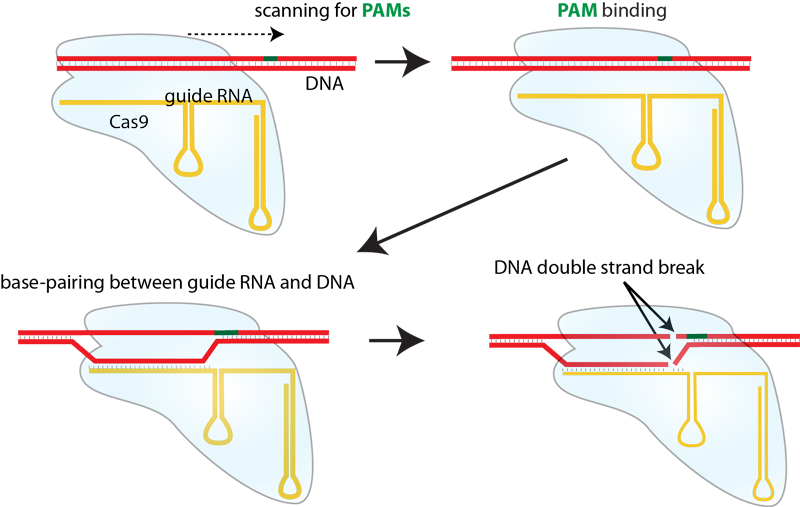 The RNA guides the cutting of the endonuclease by RNA-DNA base pairing. The host microbe's CRISPR array is not cut by the nuclease because a motif required for cutting (the PAM), and present in the infecting DNA, is removed during acquisition, thus distinguishing self and non-self. The Streptococcus pyogenes Cas9 protein scans double-stranded DNA for a short sequence motif (the PAM) and if the guide RNA can base-pair with the immediately adjacent DNA sequence, the nuclease cuts both strands. How does a DNA double-strand break lead to gene targeting? Double-strand breaks (DSBs) in cellular DNA are repaired by either imprecise nonhomologous end-joining or by precise homology-directed repair if homologous DNA is present (NHEJ and HDR). Several distinct families of designer nucleases have been developed to cut at single specified sites in the genome to take advantage of these repair processes, leading to either gene knockout by mutagenic NHEJ or precise editing by HDR. Each successive designer nuclease system--ZFN, TALEN and CRISPR/Cas--has improved on the previous. All three have been proven to induce knockout and point mutant germ line mutations through injection of the nucleases and targeting vectors into fertilized eggs (Carbery et al., 2010; Meyer et al., 2010; Cui et al., 2011; Meyer et al., 2012; Sung et al., 2013; Qiu et al., 2013; Wefers et al., 2013; Wang et al., 2013; Wu et al., 2013; Davies et al., 2013; Yang et al., 2013). CRISPR/Cas nucleases are easier to build, more active, less toxic and have lower off-target mutation rates. Mutagenesis with CRISPR/Cas is universal, simple, specific and highly efficient. The Streptococcus pyogenes Cas9 with guide RNAs has been used to mutate genes in cultured cells, in the germ line of organisms from plants to primates, as well as in yeasts and bacteria. To knock out a gene the requirements are simple: the Cas9 protein and an easy-to-construct guide RNA. To edit a gene, an oligonucleotide targeting vector is also introduced. The guide RNAs are easy to build and the targeting vectors can be made by DNA synthesis. The nuclease is highly specific with low rates of off-target mutagenesis. Most significantly, CRISPR/Cas is 10Ë†5 to 10Ë†8 times more efficient than traditional gene targeting by homologous recombination and about 10 times more efficient than ZFNs and TALENs. It is so efficient that germ line mutations can be recovered from injection of fertilized eggs. The high rate of CRISPR-mediated mutagenesis means that gene targeted mice can be made by injecting the nuclease into fertilized eggs, generating mice which have the desired mutation in enough of their cells that they can transmit the mutation to the next generation. In fact, in many cases mutagenesis is so efficient that both copies of a gene can be mutated in the same cell. The length of homologous DNA required for HDR sequence alteration is small: synthetic oligos no larger than 120bp are sufficient. These differences result in enormous savings in time and money. Figure 8. Injection of CRISPR/Cas reagents into fertilized mouse eggs is a much quicker and cheaper means to targeted mouse mutants. The error-prone non-homologous end-joining (NHEJ) repair at double-strand breaks typically leads to small deletions at the cut site: many of these will result in frame-shift mutations and thus null mutation. NHEJ is the preferred repair pathway, used about 90% of the time. NHEJ can be used to efficiently insert a transgene at a DSB, or paired DSBs can be used to efficiently delete larger sequences. Precise homology-directed repair (HDR) is best at introducing small edits. The sequence edits by HDR are most efficient if the sequence alterations are very close to the induced DSB (see Figure 6 in Elliott et al., 1998). Large sequence replacements by HDR occur much less frequently. 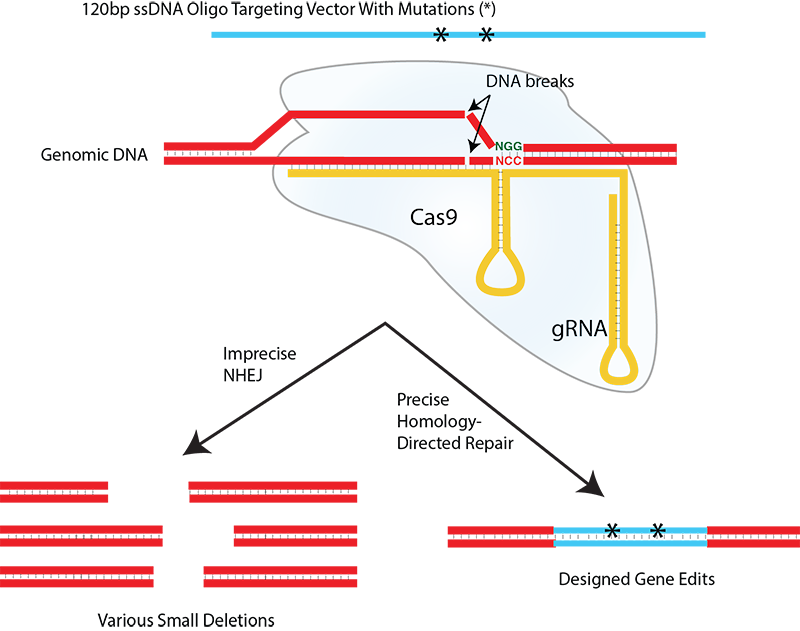 CRISPR/Cas consists of two components, a target-specific guide RNA and non-target-specific nuclease (Cas9). The RNA is designed to base pair to the target through a 20 nucleotide sequence. A PAM (NGG) sequence must be adjacent to this 20 nucleotide homology in the target DNA, but is not encoded in the guide RNA. The endonuclease Cas9 binds to the double-stranded PAM by a mechanism similar to a transcription factor, and then the guide RNA begins to base pair with the adjacent sequence. If there is both PAM recognition and good RNA-DNA hybridization, the nuclease is activated. Mutations resulting from repair or replacement stop further cutting by the nuclease. As many as 30-90% of cells which take up CRISPR/Cas can have targeted small deletions. The efficiency of gene targeting by homology-directed repair is lower, and occurs against a background of the targeted small deletions, but constitutes 1-10% of all mutations. All the designer nuclease, DSB-based mutagenesis systems have the unusual property that mutations at different sites or alleles are not wholly independent--in other words, the frequency at which double mutants are recovered is greater than the product of the individual mutation frequencies. Mutations in both alleles of a gene are the rule rather than the exception and simultaneous mutation of 8 sites in the genome in individual cells have been recovered at high rates with CRISPR/Cas. The high rate of mutagenesis by NHEJ at DSBs can be a problem when null mutation can cause cell or embryo lethality. In these cases, it is preferable to mutate only one allele by HDR. This can be accomplished with paired guide RNAs and a nuclease that has been converted to a nickase by mutation such that 5' overhangs of offset nicks are generated (Ran et al, 2013). The rates of HDR at offset nicks of this type are reported to be as high as those at DSBs. In addition, off-target mutations are greatly reduced. The founder mice from CRISPR/Cas injection can be highly mosaic for different mutations (for example, see Yen et al., 2014). It is not until the next, F1, generation that heterozygotes are established which will transmit in a Mendelian manner. Moreover, because of founder mosaicism, individual F1 mice should be used to establish separate lines, not assuming that all similar mutations transmitted from the founder are identical. Lastly, although unlinked second-site mutations are not a major concern, linked mutations at the targeted locus have been reported to have a high frequency in some studies (Yen et al., 2014). Therefore, in HDR targeting projects, the targeted locus should be characterized thoroughly by sequencing in the F1 generation to exclude unintended second site mutations in the targeted locus. Carbery et al., Targeted genome modification in mice using zinc-finger nucleases. Genetics. 2010 Oct;186(2):451-9. Sung et al., Knockout mice created by TALEN-mediated gene targeting. Nat Biotechnol. 2013 Jan;31(1):23-4. Valton et al., Overcoming transcription activator-like effector (TALE) DNA binding domain sensitivity to cytosine methylation. J Biol Chem. 2012 Nov 9;287(46):38427-32. Elliott et al., Gene conversion tracts from double-strand break repair in mammalian cells. Mol Cell Biol. 1998 Jan;18(1):93-101. Donoho et al., Analysis of gene targeting and intrachromosomal homologous recombination stimulated by genomic double-strand breaks in mouse embryonic stem cells. Mol Cell Biol. 1998 Jul;18(7):4070-8.